The Singspiel Zaide was written for a theatre company visiting Salzburg 1779 and the aim was probably to have it performed in Vienna. But this came to nothing and Mozart never completed the work. Fifteen numbers were however composed when he abandoned the project, and since his habit was to write the overture the last thing he did. It has been supposed that his little one-movement symphony in G, K 318, dated Salzburg 26 April 1779, was intended for the Singspiel – which incidentally was titled Das Serail from the beginning – but on the present recording a powerful and dramatic entr’acte from the incidental music for Thamos from the same year is used, and this works perfectly well. Singspiel means that there is spoken dialogue, but this has not been preserved so we don’t really know what the work is about. Nicolaus Harnoncourt presented the work some ten years ago with Tobias Moretti delivering a narration between the musical numbers giving a plausible story line. The present recording has only the music but the libretto also prints a few words before many of the arias. This is the end of the spoken dialogue, which Mozart obviously wrote into his score as a kind of cue. 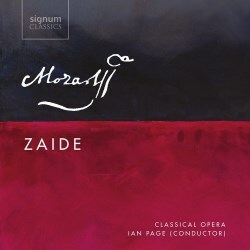 What is unique about Zaide is the inclusion of two melodramas, spoken text overlaid orchestral music. This is something pointing forward to Beethoven and Weber and the music is in both instances unusually dramatic. It’s a pity though that the balance favours the orchestra and makes it difficult to hear the words properly. Mozart created a lot of excellent music for Zaide and one number in particular has claims to be one of his finest arias, Zaide’s Ruhe sanft (tr. 4). The trio (tr. 9) that concludes the first act is also a fine work, as is the final quartet (tr. 17). Ian Page’s Mozart cycle has been greatly admired and I was enthusiastic about his Mitridate a couple of years ago. What has attracted reviewers in particular is the freshness of the playing. The Orchestra of Classical Opera is a band steeped in the recent tradition of authenticity and they produce a sound that is at the same time full and meaty but also slim and transparent. They play with verve and involvement. The sextet of young singers is also splendid. Soprano Sophie Bevan also sang in Mitridate and the good impression I got then is confirmed here. She has a dream start with Ruhe sanft but has two more arias in the second act where she is just as excellent and she graces three ensembles as well. Good words about tenor Allan Clayton have reached me and I wasn’t disappointed when I listened to the aria Rase, Schicksal (tr. 5). Quite the contrary in fact. Here is a singer ready to conquer the great Mozart roles: Belmonte, Don Ottavio, Ferrando, Tamino. He has one more aria in the first act (tr. 7), a duet and a trio but in the second act he only appears in the final quartet. But in that act Sultan Soliman appears and he is also tenor. And what a tenor! Stuart Jackson is certainly excellent and the aria Der stolze Löw läßt sich zwar zähmen (tr. 11) really good. His second aria is also a highlight. The South African lyrical baritone Jacques Imbrailo phrases elegant in his act I aria (tr. 8) and he is even better in the one in the second act (tr. 14), where he sings so beautifully with unforced tone. Osmin has only one aria on his lot but this dramatic outburst is excellently executed by Darren Jeffery. He also takes the role of Zaram in the second melodrama (tr. 10). Zaide has been recorded at least a dozen times from René Leibowitz in 1952 with Mattiwilda Dobbs and Hugues Cuenod as Zaide and Gomatz and I haven’t heard all of them but I have Bernhard Klee with Edith Mathis and Peter Schreier, Paul Goodwin with Lynne Dawson and Hans Peter Blochwitz and the Harnoncourt recording mentioned above with Diana Damrau and Michael Schade. All three are well worth owning, but this new version with Ian Page and an excellent cast of singers is in the same class and surpasses the others through the inspired playing of The Orchestra of Classical Opera.